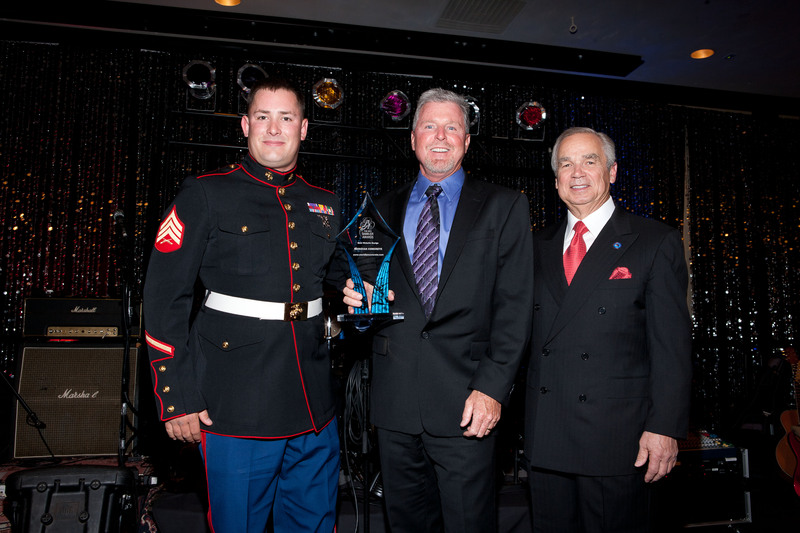 President Gary Crosswhite accepting a 2011 BANN’er award for Best Website Design at the Builders Association of Northern Nevada’s annual awards night. Presenting the award to Gary is Dylan Gray, the disabled veteran that received the house built by Homes for Our Troops and the local building community (see other post for more information). It was a great night. I’ve been a resident of Reno most of my life and remember many winters that have had snow on the ground and freezing temperatures for weeks. We are very fortunate that in our area of the country the sun shines most of the time, even in winter. And usually, the sun’s warmth keeps the snow and ice from remaining on the streets for not more than a few hours. But there have been times when inversions, overcast days and freezing temperatures keep the snow and ice on the roads, driveways, and walks for weeks. Many city ordinances require homeowners and business owners to keep sidewalks clear of snow and ice, and our community’s efforts to comply are usually evidenced by local shortages of snow shovels and ice melt products. While road salt and de-icing products seem like a necessity in cold temperatures, the damage caused by the use and mis-use of these products is now evident on many concrete driveways and walkways. While these compounds are helpful in softening snow and ice, they are often overused or mis-used to the detriment of the concrete. Damaged concrete can spall or scale (the flaking or peeling of the top layer of your concrete), destroying the integrity of the concrete and the overall appearance. The instructions on most de-icing products state that the slush should be removed quickly from the concrete or surface that it was applied to. With some products, “quickly” means in as little as ten minutes. The moisture from rain and snow works its way down into the porous surface of the concrete. Upon freezing, the ice creates a bond with the concrete. De-icing products are designed to break this bond, which allows the user to shovel the ice and slush off of the concrete. Damage to the concrete occurs when the de-icing product is left on the concrete for long periods of time or indefinitely. Additionally, if the product is over-used or excessively used, damage will occur. Most de-icer instructions stipulate the correct amounts to use and they are usually in the range of ¼ to ½ cup per three square yards. This amount is equivalent to a small handful in your cupped hand used over an area of 9 feet wide by 9 feet long or approximately 4 small handfuls applied to a typical residential driveway. In March, Gary Crosswhite and several Meridian Concrete, Inc. employees donated labor to pour the concrete slab for a new house that is being built by Homes for Our Troops in Wellington, NV. Homes for Our Troops, a national non-profit organization that was founded in 2004, is committed to helping veterans that have served our country and returned home with serious disabilities. They assist severely injured Servicemen and Servicewomen and their immediate families by raising donations of money, building materials and professional labor to coordinate the process of building a home that accommodates the injured veteran. Marine Sgt. Kenneth “Dylan” Gray and his family will live in the specially adapted home once it is completed. He was left a double amputee after his HUMVEE drove over an anti-tank mine in Iraq. The home will allow Sgt. Gray to access all areas of his home independently while in his wheelchair. “It’s a great project to be involved in and very rewarding to know we are helping our Servicemen and Servicewomen who have given so much to our country” said Gary. For more information on Homes For Our Troops, visit www.homesforourtroops.org. This foundation was located in the eastern Sierra community of June Lake, CA. The site was on the side of a granite mountain and presented many challenges to the general contractor, the excavator, and us. We incorporated many different construction techniques to place this foundation on this particular lot. The lot itself was aggressively sloped and located about ¾ mile off of the main road at the end of a very narrow lane. This presented logistical problems as we did not have the open space for materials, vehicles, and maneuvering. The concrete mixers could not turn around so they backed the trucks up the entire narrow road to the jobsite. Over 15,000 pounds of rebar was dropped at the base of the access road and later moved by us to the pad. In addition, there were numerous large granite boulders throughout the site. It took a month and a half with a 50,000 lb rock hammer on a big excavator to clear enough of the rocks away for the preliminary pad. When we first started laying out the footing, there was one enormous boulder that protruded into the interior stairwell. The rock was blasted with dynamite and then chiseled by hand to provide clearance for the stairs. The footings were on multiple elevations and wove their way over rocks and around 400 year old trees. We drilled and epoxied rebar into the boulders to attach the foundation to the hillside. At one point on the lowest level, the footings were almost 11’ wide. The garage wall was 16’ high and in places, 18” thick. The change in elevation from the bottom of the first footing to the top of the highest wall was over 29’. The foundation required several special inspections including a review by the structural engineer before the footing was poured and numerous inspections by the geotechnical engineer. The geotechnical engineer actually supervised us installing the rebar into the granite. The footing step from the garage level to one of the upper levels was 4’6” wide and 16’ tall. It used over 35,000 lbs of concrete alone. To hold it in place, we drilled and epoxied threaded rods into the granite and built a framework of 4×6 beams and covered it with plywood to make a form. All of this work had to be completed in place using scaffolding. 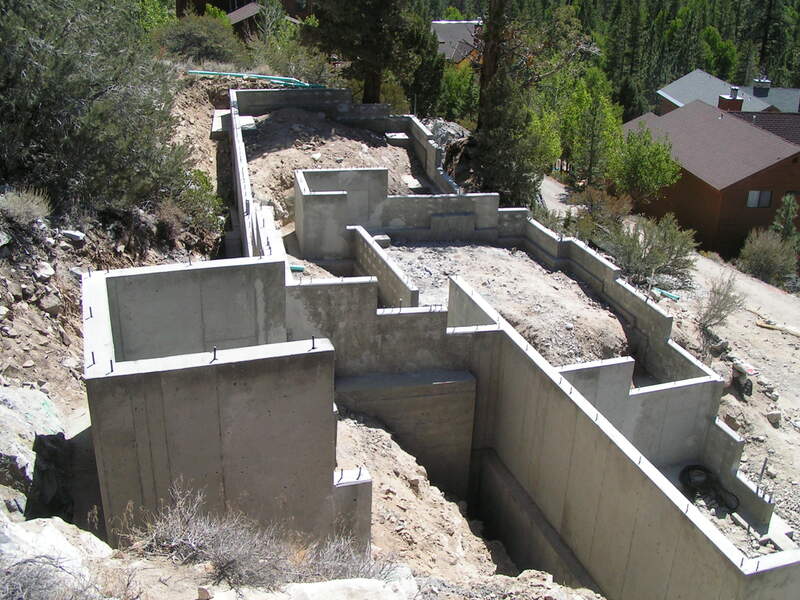 Due to the design of the house and the site, the formwork for the foundation walls utilized both our aluminum panel system and our wood forms and had approximately 20 steps with several different wall angles.